Feathers look absolutely sensational onstage. Whether you’re using huge Sally Rand fans, rockin’ a lusciously fat boa, or wearing a costume and/or headdress trimmed with feathers, they always look glamorous and amazing. The plumes waft through the air looking elegant and ethereal or flirtatiously accent every shimmy. They also make the audience swoon like nothing else. But beautiful plumed costumes, props and accessories are also expensive….so you should definitely know how to maintain them! The first thing you need to know is that plumes pick up oils from your skin quite easily. Our natural sebaceous oils will adhere to the feathers and attract more dirt. Always wash your hands before using your fans or wearing your boas; please don’t wear any oily body lotions when using these props. And remember: lip gloss is literally The Kiss Of Death onstage – not just cause it will mess up your feather props and costume pieces, but because you’ll spend the entire show spitting errant fluff out of your mouth! Store your large ( or smaller) plumed fans in one of those long, sturdy locking plastic containers. Rubbermaid makes a terrific, rectangular giant sized one… but you can find several types at places like Target or Walmart, too. You can easily fit a couple of sets of Sally Rand fans- and more, if they’re smaller- in these without cramping them. Make sure to lay the feathers into the container with the plumes facing up so you won’t break the spines. Before sealing the box for storage, add in cedar chip sachets or plenty of cedar balls to prevent insect infestation- moths adore fans! You can also use good old mothbalss, but I dislike them for two reasons: they stink like chemicals, and more importantly, they’re toxic to pets. I have a specially made carrying case for transporting my Sally Rand fans to local gigs, but a long, wide document tube or Fed Ex box would work just as well! For air travel, your fans will undoubtedly need to be checked ( they’re usually too long for the storage bins in the cabin) so make sure you pad whatever container you’re using well and include your little tool kit. Store your feather boas in the same way you would your Sally Rand fans or smaller feather fans- in a tightly sealed plastic container, with cedar chips to keep moths away. Depending on the size of the boa, you can use abig round container, the type made for large cakes. Coil the boa up like a snake ( a boa snake, of course!) and close the container. Larger boas might not fit into a cake container, so some gals store their boas in round hat boxes. When I do this, then I seal the boa in a large plastic bag with the cedar chips before putting it in the hat box- just to be extra careful about insect infestation. 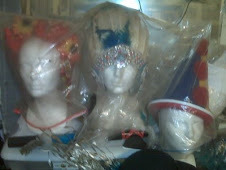 To store headdresses, I have found that the easiest way is to place them on a Styrofoam wig stand, and pin them securely onto the wig head itself. I then wrap the headdress in plastic wrap, sealing it firmly around the bottom of the wig-head, and store the entire thing on a shelf. Again, throw in a sachet of cedar chips. If your headdress is large, you can also stick an opened-up wire hanger or two into the Styrofoam, to create a “tent”, holding the plastic up so it won’t break or bend the feathers. You might also have to weigh down the bottom of the stand to prevent it from toppling over due to the height and weight of the headdress. 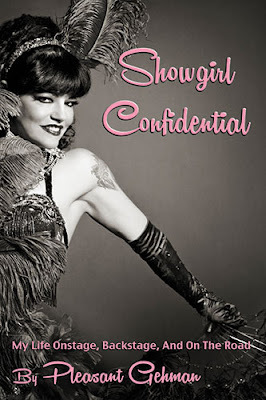 Feather boas and feathered headresses are simply the height of glamour- but since feathers are basically an animal ( or rather, avian) product, they tend to dry out over time and can become droopy or flattened out and limp. To restore your boas to their brand-new fluffiness, you’ll need to care for them and maintain them occasionally. 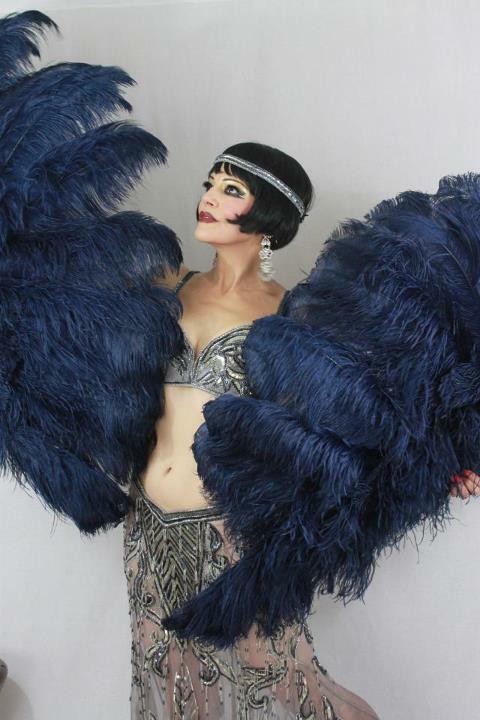 Grab your boa and briskly but gently feathers between your hands. This will shake off any dust as well as fluff up the “nap” of the feathers, making each one look perky again. You can also clean the feathers on your headdresses the same way- but instead of using your entire hand, fluff each feather individually with your fingers. For a costume that has feathered accents, do the same – just fluff the plumes with your fingers. Next, steam your boa or headdress. If you have a clothing steamer, hang the boa up by one end and steam it this way, being super-careful not to get the tip of the steamer too close to the feathers- you want the fine mist to cover the boa, but you don’t want it dripping wet! Steam each section of the boa only for a few seconds, until the feathers have opened up. For a headdress, do this while the headdress is sitting on the wig stand. If you’re cleaning feather accents that are sewed or glued to a costume, use your steamer in the same way. If you don’t own or have access to a steamer, you can also use a tea kettle or a large pot full of boiling water to steam your boa, holding it horizontally over the pot or kettle, steaming it in sections. For headdresses, make sure to hit only the tips of the feathers with steam- try not to get the crown wet. I do not recommend this method for costumes with feather accents, though. Be very careful not to burn your hands or fingers- steam is just as hot-if not more so- than boiling water! Make sure to turn off the flame on the stove burner off while doing this or you’ll be courting disaster… BOAS AND FEATHERS ARE HIGHLY FLAMMABLE! If you maintain your gorgeous feathered costumes and props well, they’ll look great for years! Come say hi to me on the Inter-Webs !